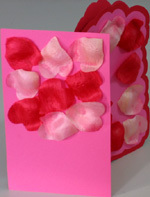 Making a love card with heart shaped petals as the greeting card art might seem conventional. However, consider this: where do you find or buy heart shaped petals? Not in the craft sections or Valentine sections of stores. But, usually, in the wedding sections and wedding stores. Therefore, the real question is, what do you do with the remaining petals after the wedding? I recently came across the petal leftovers used in my wedding. And, yes you guessed it, I got inspired to create a love card with the petals as the greeting card art. Usually, cards have words on the cover. But this one has none. Yet, it's application is self-evident. This transforms it from a cool creative card into a cool unique card. Additionally, this unique feature makes it easy to come up with funny greeting card messages to put inside. Please remember to replace the number (in this case, 2) with the correct ratio that suits your case. Bottom line, even with no words on the cover, this unique love greeting card is great as an anniversary card, Valentine Day greeting card, Mother’s Day card, “just because” card, or something else. Hence, How will you use yours? More interestingly, how many petals will you use in making yours? So, how many petals does it really take to express affection on a love card without words on the cover? My first card making attempt didn't turn out as anticipated. It was missing something - elegance. Specifically, the petals were cramped in, as if starving for attention and love. There was no way these petals were going to convey affection if each one seemed deprived of it. Fortunately, after stopping halfway, there were still enough petals left to start over. Organize the flower petals on the 5” x 8” lollipop pink cardstock leaving about 0.25” space from cardstock edge to petal edge. Glue the petals in place on the cardstock. With wavy petals, the goal is for the petals to retain their shapes at the end of the exercise. So it's key to glue down the petals just where they come in contact with the paper. And only a few spots actually touch the picture. The picture here shows three spots per petal to glue the pieces. The spot locations depend on the side touching the paper. For clarity, the spots are marked in black. 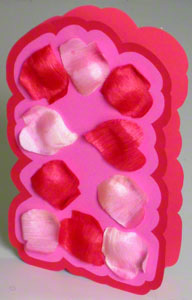 Draw the silhouette of the petals on the lollipop pink cardstock giving about 0.25” margin. Use scissors to cut out the silhouette on the lollipop pink cardstock. Score and fold the 8.5” x 11”cardinal red cardstock paper into a 5.5” x 8.5” card. Glue the finished lollipop pink cardstock in the center of the folded scarlet red card leaving a 0.25” margin. Draw the silhouette of the lollipop pink cardstock on the cardinal red cardstock giving about 0.25” margin. Use scissors to cut out the silhouette on the cardinal red card. Finally, erase all pencil marks. While cutting the unique romantic greeting card, remember to leave enough space for the seam so that the card can still open up.